Japan loves hair salons and fancy hair. For centuries, the country has been obsessed with various coiffures. Today is no different. This hairstyle, however, is. The style is called "Ripe Tomato" ("kanjuku tomato" or 完熟トマト). It was done by a stylist named "Hiro" at an Osaka salon called "Trick Store", which is located the city's hipster youth district, Amemura. Trick Store's styles are what some would call "cutting edge". Others might say they're odd! I think they're interesting and fun. They are, however, not mainstream. 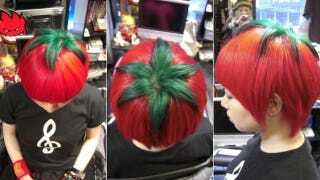 Japanese teens are not running around with "Ripe Tomato" hairdos. Yet. Here are some more edgy hairstyles from Trick Store and other salons around Japan. And yes, there are the inevitable "These look like Final Fantasy" hairstyles, too. And as interesting as these styles are, they cannot top the women who put plastic mecha models in their hair. Nothing can top that. Nothing. Oh no. Japan can do better—or rather, the girls at fashion magazine Koakuma Ageha can. For more on hair and Japan, be sure to check out this piece I wrote a few years back.